Are you looking for OAVS Recruitment 2019? If yes. there is a news for you. 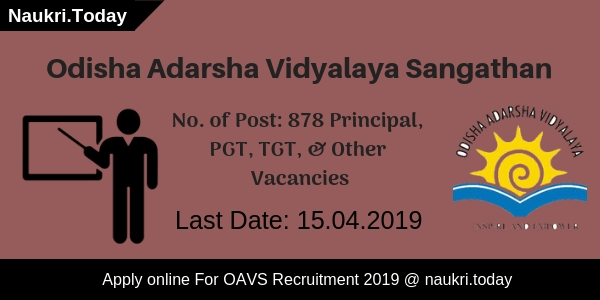 Odisha Adarsha Vidyalaya Sangathan has published notification for Principal, PGT, TGT & Other Vacancies at the official website. There are 878 Positions are available for OVAS Jobs 2019. The Online Registration Process will be started on 14 March 2019. Candidates may fill up their application form before the last dates that is 15 April 2019. Participants who have Masters Degree are eligible for Principal Posts. Candidates who are going to apply for principal posts have to pay Rs. 1500/- and for other Teaching Posts pay Rs. 1000/- as an application fee. 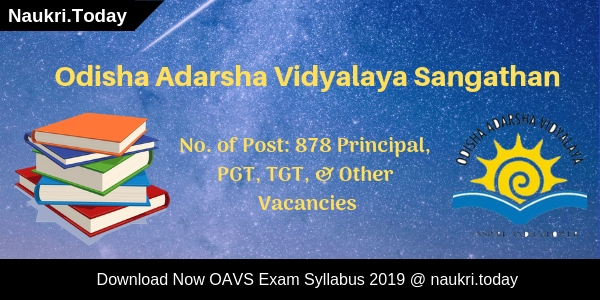 Fresh Update as on 26.02.2019: Odisha Adarsha Vidhyalaya Sangathan is going to appoint candidates on 878 Principal, PGT, TGT, & Other Posts. Applicants should collect here complete details regarding eligibility criteria for OAVS Recruitment 2019. Here we gave to linsk to apply for OAVS Vacancy 2019 before the last date. How I Fill Online Application for Odisha OAVS Recruitment 2017 ? Vacancy Name Principal, PGT, TGT, & Other Vacancies. Degree & Post Graduation in relevant subject from any recognize university with at least 45%. B.Ed. from an institution recognized by NCTE and affiliated to a recognized University. What Is The Pay Scale For Odisha AVS Jobs 2019? Applicants should check here Post Wise Pay scale For OAVS Principal Bharti 2019. Conclusion: Odisha Adarsha Vidyalaya Sangathan has released notification for 878 Principal PGT, TGT, & Other Vacancies. Interested candidates may apply online for OAVS Recruitment 2019 from links given here. Odisha Adarsha Vidyalaya Sangathan has released a notification for OAVS Recruitment 2018. School & Mass Education Department are inviting candidates to fill up online application forms for 1544 posts. Participants who are interested for Principal, TGT, PGT Jobs 2018, they can fill online registration form starts on 16.03.2018. OAVS PGT TGT Vacancy Last Date of submission online form is 10.04.2018. Furthermore, information Odisha Adarcha Vidhyalay Sangathan Recruitment is mention on the below article. OAVS is inviting online application for filling up 1544 Principal, PGT, TGT Vacancies. OAVS Jobs Online Form already available on the official site. Applicants should submit their application form before the last date of registration. Furthermore information of OAVS Principal Vacancy, candidates should read this article carefully. You can also check the official notification, link is given below. Candidates who are interested for filling the OAVS Jobs online registration form they are available here. In OAVS Recruitment 2018 participants check the online application form opening and closing date and more information they visit the official website. Participants who are going to OAVS Jobs 2018 they must check vacancies division according to their eligibility and branch. Aspirants may also check the official OAVS PGT Notification given link below. Applicants who are appear in OAVS Jobs 2018 they must check the eligibility criteria for different vacancies. We are provide more information about qualification, Age Limit, etc. Candidate must check there eligibility for your OAVS Principle vacancy. Candidates education qualification are divided by a different categories. All the participants who fill up the OAVS Application form they must have been on 10th with recognized board. More details about education qualification of OAVS TGT Jobs, applicants must read the full article. Principal: Participants have a Master Degree for recognized university with minimum 45% marks in aggregate. Applicants should complete B.Ed from a recognized University. TGT: In Trained Graduate Teacher have a different teacher vacancies for subject wise and the participants graduate in their subject. Candidates have a 4 years integrated degree course with at least 50% marks in aggregate. Furthermore check OAVS TGT Recruitment Notification. PGT: Applicants completed master degree from a recognized university with at least 50% marks in aggregate. And they have 2 years post graduate course in different subjects. Furthermore check OAVS PGT Job Notification. Others Teaching Posts: Applicants must be completed graduate in their required subjects for a recognized university. Furthermore you can also check OAVS Recruitment Notification, which is mention below. In OAVS Recruitment 2018 Candidates date of birth as recorded in secondary examination mark sheet will only be accepted in online application. Different vacancy to be different age criteria. For OAVS Principal Vacancy : applicants age should be 32 years to 45 years as on 01.03.2018. Other OAVS Jobs : Participants who are looking for different vacancy there age should be 21 years to 32 years as on 01.03.2018. In case of SC/ST, Women the upper age limit shall be relaxed by 5 years and PH candidates upper age limit shall be relaxed by 10 years. Participants who are fill up the OAVS Vacancy online application form they are firstly check the selection process in their Jobs. Candidates will be selected on the basis of their performance in Computer Based Test (CBT), Interview and Performance Test. Applicants who qualify in computer based test is merit list basis they are going for interview. Furthermore details aspirants read the full article and check the OAVS Recruitment notification given link below. The participants who are appear in OAVS Jobs there Computer Based Test centers are located for different cities. Candidates check there exam centre is given below. Any more details about OAVS Recruitment 2018 exam centre mention on official notification. Aspirants who are selected in OAVS vacancy exam, there pay scale is here. Candidates who appear in different post there pay scale and grade pay check in given below. Applicants who are selected for OAVS Principal Vacancy, after joining they will receive Rs. 15600/- to Rs. 39100/- and Grade pay Rs. 6600/-. Computer Teacher vacancy selected applicants will receive Rs. 13900/- for OAVS PGT Recruitment. Participants who are interested for OAVS TGT Recruitment they are apply via online mode. If you want more details regarding application fee, you can check OAVS Notification, which is given below. Candidates who are going to apply for OAVS Principle Vacancy 2018 their application fee of should be 1500/-. Applicants who are applied for other teacher vacancies their application fee should be Rs. 1000/- . Candidates who are interested for OAVS Vacancy they can fill online application form till the last date. Applicants can follow easy steps to fill OAVS TGT & PGT Online Forms. Firstly, candidates log on to the official website www.oavs.in. Now click on the OAVS Notification. Read all the instruction and information carefully. Candidates fill all information in form correctly. Applicants now deposit the OAVS Recruitment application fees. Now participants check the all details carefully that they are fill correct or not. You can direct apply through below link. Conclusion: OAVS Recruitment 2018 for 1544 Principal, TGT & PGT Vacancies. Interested candidates who are going to fill up OAVS TGT & PGT online application form there opening date 16.03.2018. The last date of submission application form is 10.04.2018. Odisha Adarsha Vidyalaya Sangathan is inviting online application for those candidates who are looking for OAVS TGT Vacancy 2017. There are 1090 Principal , TGT Teacher & Other Teaching Staff Jobs. eligible candidates can submit application form for OAVS Recruitment 2017 through online mode. You may apply online form for Odisha Adarsha Vidyalaya recruitment 2017 on or before the last date 09.02.2017. OAVS Odisha has published a recruitment advertisement of 1090 Principal & Teaching Staff Jobs. Candidates who are looking for Odisha Adarsha Vidyalaya Vacancy 2017 can fill online application before the last date. Online registration for OAVS Teacher Recruitment 2017 has been started from 09.01.2017. For more information you can check given below details. Age of the candidates for Principal Vacancy should be in between 32 years to 45 years. For remaining Odisha OAVS Vacancy (TGT, PET & Other), required age limit should be in between 21 years to 32 years as on 24.12.2017. Age relaxation is applicable as per Department norms for OAVS Teacher Vacancy 2017. Principal Jobs : Master’s Degree with minimum 45 % Marks from any recognized University for Odisha Adarsha Vidyalaya Jobs 2017. TGT Teacher Jobs (Various Subjects) : Candidates should have done Bachelor’s Degree in respective trade or equivalent qualification from authorized University for Odisha Adarsha Vidyalaya Teacher Recruitment 2017. PET Vacancy : Applicants must have done Graduation/ Post Graduation in Physical education for filling online form for OAVS Recruitment 2017. Music Teacher Post : Senior Secondary/ Degree in Music or equivalent qualification for OAVS Odisha Vacancy 2017. Computer Teacher Jobs : Candidates should have done Bachelor’s Degree/ Master’s Degree in Computer Science or DOEACC Certificate for OAVS Vacancy 2017. Candidates should paid Rs. 1500/- for applying online application fee for Principal Jobs. Applicants must paid Rs. 1000/- for applying OAVS TGT Jobs Online Application (Remaining Post). Application fee should deposit through Debit Card/Credit Card or through Net Banking. For Post No. 01 : Candidates will paid Rs. 15,600/- to 39.100/- with grade pay Rs. 6,600/- for OAVS Principal Jobs 2017. Post No. 02 to 08, 10 : Rs. 9,300/- to 34,800/- + Grade Pay Rs. 4,600/- will paid for Odisha Adarsha Vidyalaya TGT Vacancy 2017. Post No. 09 & 11 : Applicants will paid Pay band Rs. 9,300/- to 34,800/- + GP Rs. 4,200/- for PET & Music Teacher Jobs. For Post No. 12 : For this post , selected applicants will paid Rs. 13,900/- per month. Odisha Adarsha Vidyalaya Recruitment 2017 Selection Criteria : Selection of the qualified candidates for Odisha OAVS Recruitment 2017 will on the basis of Online Computer Based Test, Interview & Performance Test. Principal Vacancy : For this vacancy, exam will objective type in nature with having total 180 question. The Exam will be divided in Four Parts. Candidates should get minimum passing marks for each section of exam for qualifying the exam. After Written exam, Selected candidates will called for Interview round. Final Selection will based on Merit list. 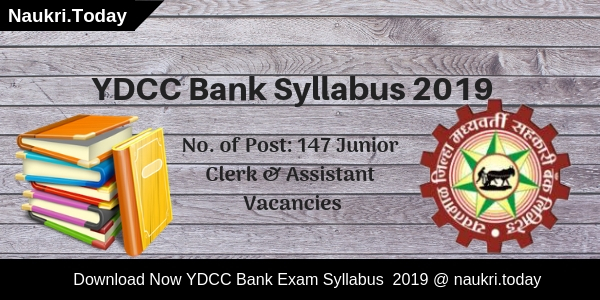 For more details about exam Syllabus & Other, you can check from here. Keep visit this page for more updates about Odisha Adarsha Vidyalaya Vacancy 2017. First of all log on to the official website www.oavs.in. After that click on official OAVS Vacancy Notification link. Odisha OAVS Recruitment 2017 for 1090 Principal & Teaching Staff Jobs. Candidates can fill application form for Odisha Model School Teacher Vacancy 2017 on or before the last date 09.02.2017.